There are many ways for getting in shape, but one of the most popular is running on a treadmill. This article will focus on a very specific type of treadmills: the portable treadmill. If you compare it to a normal treadmill, the benefits are obvious. Being able to take your treadmill anyplace you want is actually much more useful than it seems. 1) It takes up less space. If you live in a small apartment, buying a traditional treadmill is a huge sacrifice: it takes up a lot of your space and makes cleaning much more difficult. However, if you own a portable treadmill you can just fold it up and put it in your closet. 2) You can take it anywhere. Many jobs require extensive traveling. People have to move to big cites or foreign places, sometimes even for months. This changes your whole life and can produce a great amount of stress. But if you can take your treadmill with you and still work out every day, you are much better off. Working out will reduce your stress level and keep you healthy. It will also be easier for you to continue working out every day when you’re back at home because you never made a break. As I mentioned above, it is important not to take breaks when you build up a habit. We all know this, it takes some months to build up a good habit, but then comes that one bad day. Missing one day isn’t a big problem, but soon it’s one more day and then a week and so on until one day you step on your treadmill and notice that you haven’t worked out the last two months. Continuity is the most important factor when working out. And this is what’s so great about portable treadmills: you don’t have to leave your treadmill and fall into a rut, you just take it with you wherever you go. On the other hand, treadmills can be very expensive. This can be very demotivating if you think about buying one. So you should probably take a look at some used treadmills before you decide to buy a new one. You are correct, a portable treadmill does have some big benefits. I think the major benefit you missed out on in your piece was cost benefits. You can get a good motorized home folding treadmill for $1000. 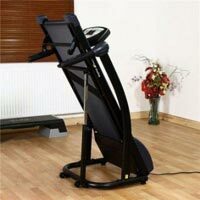 A treadmill at this price can and generally will last for years so you can offset your gym membership costs aganist it and have the convenience of a treadmill in your own home!